#FarhanAkhtar says the #digitalrevolution has lead to the language barrier falling down every single day in content consumption. Farhan interacted with media at the Hindi Trailer launch of the Kannada film, 'KGF' (Koler Gold Fields) on Wednesday. The actor was present at the event as the film's presenter alongside the lead actor Yash, Srinidhi and more. When asked if Farhan thinks language does not posse as a content barrier anymore, the filmmaker said, 'I couldn't agree more, the barrier is falling down every single day. The world is becoming a smaller place, we are enjoying work from culture and languages that we want very familiar with a few years ago. I think apart from what's happening in the film, the whole digital revolution has a huge part to plan that. We are consuming content now whether subtitled or dubbed. We are getting more and more comfortable just connecting with what it is about as a post of finding some amount of resistance because it is not in a language you are familiar with." "Eventually, filmmaking is about storytelling and the story of KGF is very very strong. It is very exciting I am very inspired. I am trying to do my beard like Yash and hopefully, someday I'll get there. But it really is an honor to present this film to Hindi audience." Talking about KGF and why he chose to bring the film to a wider Hindi audience, Farhan said "I think with every film there is a certain USP, certain draw and in this film, the story of this one character and what he is out to achieve is very strong. You get a sense of promise this child is making to his mother at the beginning of the film of what he is going to be and do. And it really follows his journey and his path. This is really something that drives the film So everything else that comes with it is actually from a place of pure emotion and pure love. That to me is the driving force of the film." KGF starring Kannada actor Yash explores the India, USA and Russia conflict that took place in the 70's and almost resulted in the 3rd world war. The story emphasises on the rise of Gold prices at that time around the world and India being a major destination that possessed a significant amount of Gold due to the Koler Gold Fields in Karnataka. 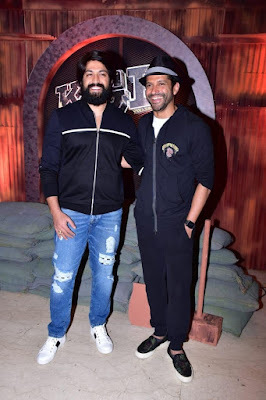 Produced by Farhan Akhtar and Riteish Sidwani’s Excel Entertainment along with Anil Thadani's AA Films, KGF aka Koler Gold Fields will release on 21st Dec.